Amazon's Choice for "the wizard"
Sold by SpReAdLoVe and ships from Amazon Fulfillment. This is one of those niche films that despite well-deserved criticism, I've always had a fondness for. I saw it in the theater, and already own it on VHS, Laserdisc and DVD. This release is about as bare-bones as they come. The first thing you'll notice if you're looking is that the cover looks like a cheap blurry over-saturated printout. I've personally designed and printed better looking covers than this with free tools and a half-broken printer. The second thing you'll probably notice is that when you put the disc in the player, instead of going to a menu, it just starts playing. The reason it does this is because it has no menu. Why does it have no menu? Because the only option is whether to turn the subtitles on or off. There are no chapter names or previews, no audio options, nothing. The film is presented in 1080p, but it was clearly scaled up from a lower-resolution transfer. The scaling artifacts are subtle and probably won't interfere with your enjoyment of the film. Honestly, it was never much to look at in the first place. The criticism I most often hear about this film is that it was a 90-minute Nintendo commercial. I've never really agreed with that assessment though. It may just be rose-colored glasses, but between the handful of awkward almost spliced-in scenes of adults playing video games, there's actually a decent and emotional story about friendship, family, and perseverance. It's true that without its obvious and prominent relation to Nintendo fandom, it would be even more obscure than it is today, but it is by no means bereft of value as a good family film. Comparing to today's movies, this one is fairly cheesy, but I first saw this movie when I was fairly little. Only reason why I decided to add it to my Amazon collection is solely for nostalgia. For me, it was nice to watch with my kids and they actually liked it as well. They giggled here and there, but they are fairly little, about the age I was when I saw this film. I'm not going to get into the whole story of it since I'm sure the preview and other reviews have spilled enough about it. Its just nice to see a film once in a while that isnt packed full of derogatory stuff and its just classic in it's own way. This movie brings back alot of memories of my childhood, i was a Nintendo fanatic at one time when i was a kid, so its great to see all of the old games, the picture quality of this movie is outstanding, i can't believe how great it is, you would think this is a blu ray disc from the way it looks, the images are so crisp and clear, i can't imagine it looking any better, not sure if they remastered it, it doesn't say anything about remastering on the case, fantastic picture transfer, this is a must have for any kid who grew up during this time, i remember having a big crush on Jenny Lewis,thought she was sooo cute, i really like some of the songs in this, they fit great with every scene especially the song, send me an angel, i have wanted this movie on dvd for the longest time, so glad i have it, only disapointment is no special features at all,only thing they have is a closed captioning option for the movie,it would have been nice to atleast have the trailer to the movie, along with a few bios of the actors,they don't even have scene selections which is a little surprising because almost all dvds have them, but if you like the movie for just the movie itself, then this is definitely worth getting, you will not be disapointed. 4.0 out of 5 starsCalifornia! 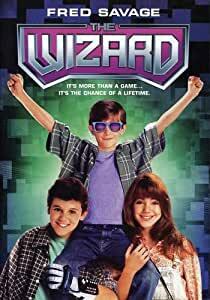 The Wizard(1989), directed by Todd Holland, is a fun, cheesy family movie from the late 1980's. Siskel and Ebert called it "one of the worst movies of 1989", but it's really not that bad. It is a commercial for Nintendo and Universal Studios, but it also delivers in showmanship. Jimmy(Luke Edwards) suffers from a mental disorder after his twin sister dies. His brother Corey(Fred Savage) takes him to California to compete in Video Armageddon. This is where the Nintendo game Super Mario Bros. 3 was introduced in the United States of America. Jenny Lewis plays a girl who helps Corey and Jimmy get to California for a share of the prize money. The adult Lewis is a member of a country-rock band. Frank McRae, Beau Bridges, and Christian Slater co-star. I remember watching TV spots for The Wizard during Christmas Vacation of 1989. I didn't get a chance to watch the film until it was shown on CBS. I remember toy stores in 1990 that had countless advertisements for Super Mario Bros. 3. On their window was a giant poster of Mario with a fox tail! This film jumped on the bandwagon at the right time. 1984's Cloak and Dagger was a Hitchcockian suspense-thriller...and a commercial for Atari! In that film, Dabney Coleman had a gadget that neatly put his parachute in his backpack! I wonder if there was an homage to that in Star Trek(2009)? The Angry Video Game Nerd and The Nostalgia Critic have already given us their opinions about the film on the web. The Wizard did spawn Wizard Reunions in Texas. The Wizard is a solid comedy-drama.